Washington, D.C. - U.S. Senator Pat Toomey (R-Pa.) is backing two separate measures that would end government shutdowns moving forward and pay federal employees who are working without compensation during the current funding impasse. "It is time to end government by crisis. 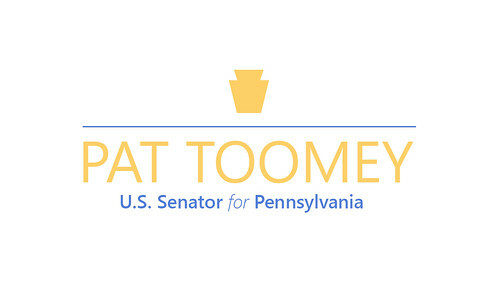 Every time Congress can't agree on a funding bill, it's our constituents and government employees that bear the brunt of Washington's dysfunction," said Senator Toomey. "These commonsense bills provide paychecks to federal employees who have been working without compensation while also preventing against future government shutdowns. We should pass both measures in short order and send to the House for consideration." The Shutdown Fairness Act (S. 113), introduced by Sen. Ron Johnson (R-Wis.), would authorize the use of funds from the U.S. Department of Treasury to pay the roughly 420,000 federal employees who have been deemed essential across nine departments and continue to work without pay during the current shutdown. Contractors supporting federal agencies in the category of essential personnel would also be paid under this legislation. The End Government Shutdowns Act (S. 104), introduced by Sen. Rob Portman (R-Ohio), provides federal agencies with continued funding should Congress not pass an appropriations bill or a continuing resolution on time. If appropriations lapse, federal agencies would be funded at their current levels for 120 days. After this initial period, funding would decrease by one percent every 90 days, absent a new funding authorization. This legislation would apply to appropriations lapses moving forward.